A motivated workforce performs better and stays longer, lowering turnover cost. But according to Personnel Today’s 2018 Living to Work report, employee motivation levels are on the decline. In 2017, 29% of employees surveyed said they were not motivated at work, compared to just 18% who said the same in 2016. Lack of motivation at workplace can have negative impact on your productivity and costs. A Gallup study found that the cost of an unmotivated workforce is $300 per year per employee. One of the ways to keep your employees motivated at work is by adapting game mechanics. It is the practical application of game techniques, aesthetics and game thinking in the non-game contexts. It takes all the essence of games – fun, play, transparency, design and challenge – and aligns those with real-world objectives. Implementing gamification in your organization can help people focus on their goals, win badges on their achievements and stay inspired. It sustains interest and brings your people back for more. How does gamification drive motivation? techniques like personalized avatars, creating an emotional connection to amplify user engagement and retention. Here are some of the ways you can apply gamification and boost employee motivation. Turning your recruiting process into game-based approach can create enthusiasm and drive participation. You can award points or badges to those employees who bring in referrals. You can also reward employees that best engage with the prospective hires during the process, based on candidate feedback. Gamify your recruiting process and boost motivation, so your recruiters focus on the candidate experience. 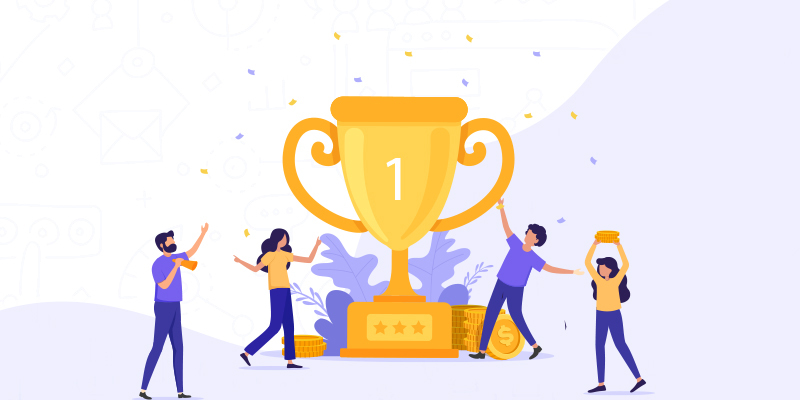 Incorporating gamification in your sales process can increase healthy competition among the team and trigger the desire to be more productive. You can reward your sales reps whenever they complete a task or a sales activity, close a deal, or succeed at cross selling. Award badges as they accomplish sales objectives and alert them with messages on points, levels and badges. Gamification can create an opportunity to reward your employees for their marketing efforts. Offer points when they actively communicate on your social profiles or promote content and drive more traffic to the website consistently. You can also reward them whenever they accomplish the team’s goals, initiate an innovative approach to a process, or go an extra mile to drive value. A well-implemented gamification strategy can have a profound effect on learning in your organization. With gamification you can create interest as you develop a story line, set goals and have timers that push learners to finish tasks in time, rewards and levelling up can act as an incentive to learn more and make learners come back for more. Implementing game mechanics into your organization requires proper road map and strategy that drives results both short term and long term. Identify the key areas, focus on pilot group, put the achievement and measurement criteria. Drive motivation and help employees seek value in what they do. Gamification can delight your employees to drive results at a faster scale.